Back from vacation! 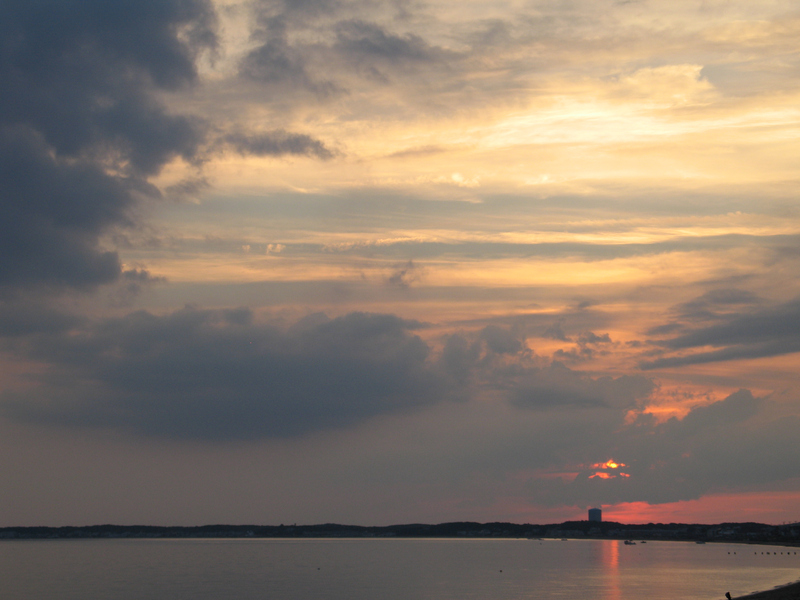 A week of Cape Cod sun, sand, salt water and doing as little as possible except enjoying those things. 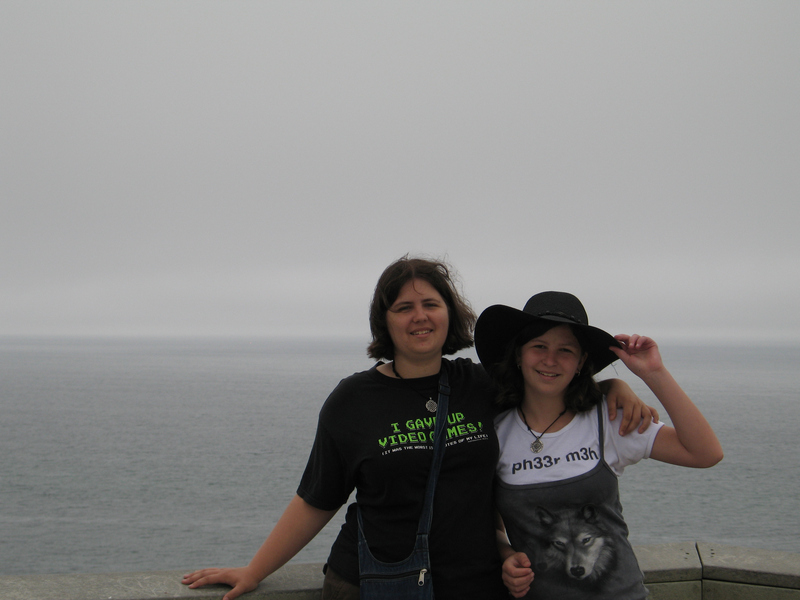 This year my mom came with us and we had a great time. We spent most of our time on the sands right at our hotel, sitting, swimming, kayaking, even watching Provincetown fireworks from our room’s deck. We did our now traditional beach paella, salmon teriyaki on the grill, and flank steak kabobs. I am rested but could be easily persuaded to do a wash-rinse-repeat of the whole week’s experience. Seven days is not enough. I present Design #1 – Twerp’s StarBee. The first design in the series. Red lines indicate straight lines “off the grid” or not at 180/90/45-degree angles. I like this cheeky little fellow. A nice one, Twerp! If you want to draw up one of your own to be posted here, please feel free to download the JPG at the project’s kickoff page, then draw on it by hand or using any graphics program. You can email the resulting file, a photo or a scan of your design to me at kbsalazar (at) gmail (dot) com. Let me know whether or not you want your name or a link posted with your offering. I do reserve the right to do light editorial selection (this is a family-rated website). Now, what progress have I made on my own stitching? Some, mostly prior to our departure. I concentrated on two pairs of socks while we were on the beach. I knit a pair of guy socks, with a simple broken rib ankle and k1p1 ribbing to finish. There is only one in this picture. The other is now at parts unknown. At best guess, I dropped it at dusk on the beach and didn’t notice that it was gone. Either seagulls or the sea made off with it. Somewhere there is either a lobster or a tern sporting a new brown habitat. And I need to get another ball of the same yarn and knit a third to make a pair. (Grrrr.) The other pair has a lacy pattern in the ankle. More on that another day. 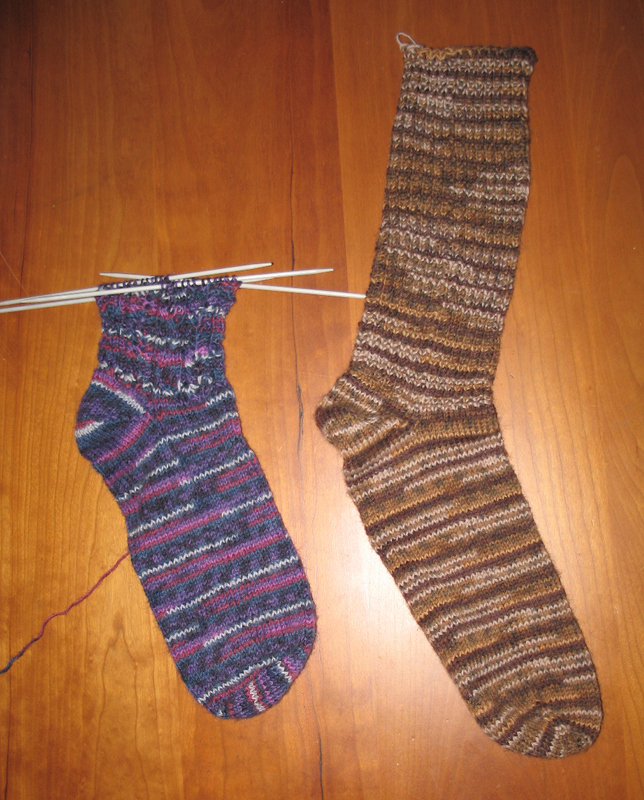 To which I will return once the socks are done. One last note – to date (using the click-through count of the fourth part) – over 1,000 people have downloaded the complete Ensamplario Atlantio since I posted it two weeks ago. If you are looking for it, it’s here. It’s a PDF file – you need a recent version Acrobat Reader to open it. You can get Reader for free, for both Mac and Windows. Although I’ve gotten some thank-you posts and a couple of questions from people unfamiliar with Acrobat, I’ve had very little other feedback, and only one bug report – of fonts not displaying properly on an iPad II running the latest version of Safari. I’m looking into that problem and may repost the files later this week. I love the Ensamplario Atlantico! Sorry to hear you haven’t gotten more feedback on it! Love Twerp’s Bee. 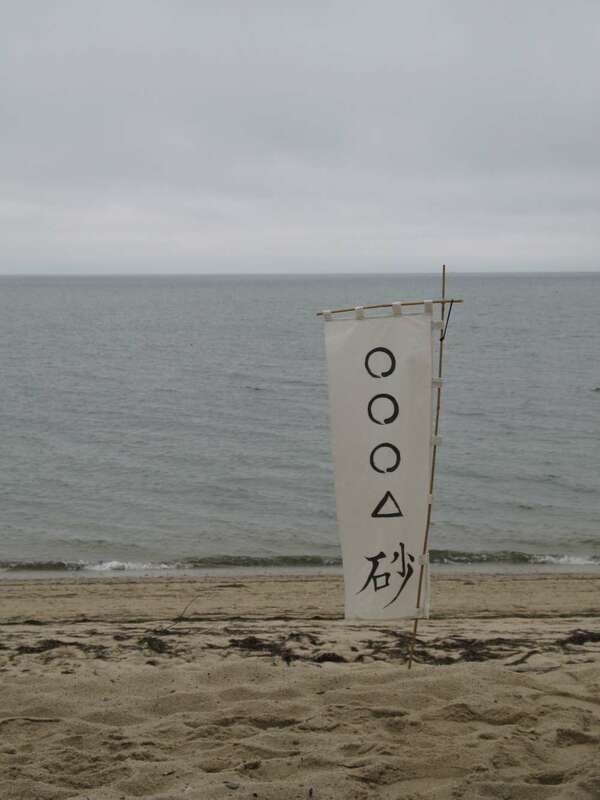 For some reason it strikes me as very Japanesque. Love the stinger. Your newest bit for the sampler reminds me of brick chimney pots sprouting trees. It’s really lovely and flows well. Elder Daughter has given up video games? I’m impressed!